I miss my little Mushu! During my streak Mushu has been at Patty's place, but since I busted today from the 2-7 single draw, I was able to spend a bit of time vegging at home. If you haven't already, you can check out my video blogs that I do regularly during the series. You can find them, as always, at www.fullcontactpoker.com. I made another run in the $3000 HORSE event coming close to the money, but bowed out about 40 spots short in a 452 player field. Oh well, can't run hot forever! 1. Played the $10,000 Stud event at 5:00pm and finished at 3:00am. Came back the next day at 1:00pm and busted in 10th place. 2. At 5:00pm that same day I bought into the $2500 PLO/NLH event and played till 3:00am that night. I came back for day 2 at 2;00pm and cashed in 43rd at around 8:00pm. 3. After busting I headed straight to the $10,000 Mixed game event, an event I was forced to miss last year due to my limit hold'em win, and was second in chips after day 1 at 3:00am. I came back for day two, but busted out at around 7:00pm. 4. I jumped into the $2500 6 max limit hold'em event and played that until 3:00am. Came back for day two and played until 3:00am again. Finished second in that event at about 10:00pm and went straight to the other room for another event. 5. I played the $10,000 Omaha H/L event until 3:00am. Returned on day 2 at 2:00pm and again played until 3:00am. On day 3 we started up at 12:00pm and I went on to finish in 4th place at about 10:00pm. 6. At 10:00pm that night I jumped into the $3000 HORSE event and played until 3:00am. Returned today at 2:00pm and went broke at about 8:00pm. 7. I played the $10,000 2-7 NL Single Draw event and was eliminated at about 9:00pm. All told, that added up to 9 consecutive 3:00am nights. In that span I watched no television at all, did nothing but play poker, eat, sleep, and lose 6 pounds in the process. Busting out this evening was a bit of a relief. I'll get a break tomorrow too as I'm playing in the Stud HL/Omaha HL mix at 5:00pm and may take my time getting there and possibly show up around 6:30pm. No golf tomorrow, although I may chip and putt a bit. I definitely want to workout a bit and stay strong. 6. Jennifer Harman: GOOSE EGG! 8. Freddie Bonyadi: Might have a cash, not sure. 1. 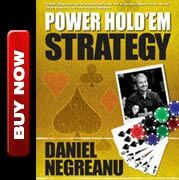 If you are playing Stud and your short stacked opponent is all in, turn over your river card first whether you are supposed to or not. It's a common courtesy to not torture an all in opponent if they are drawing dead. 2. When you bust a player, it's never OK to celebrate too much. A fist pump is cool, hands in the air is fine, but your first instinct should be to shake the person's hand and offer your condolences. After you've done that, high fiving your buddies is fine, just don't get ridiculous about it in front of the player who just busted. 3. When you beat a player in a huge pot that cripples them, don't babble and babble and babble to them about the hand saying things like, "Phew, thought you might have the King, but I'm like, oh my Gosh, please don't have a diamond in there" with a smile on your face as if the person you beat really wants to share in your glory. This is one of the most classless things you can do. The guy doesn't want to talk to you, or hear about you babbling about the hand in front of them. 1. If you are all in on a stud pot short stacked and need to squeeze out your river card, you can do that, but just don't take TOO long. 2. If you win a tournament, first congratulate the second place finisher, and after that, with the event being over, you can go bananas with your buddies if you please. Show emotion, why not. People watching (outside of the second place finisher) appreciate seeing how happy you are, so being stone faced when you win doesn't make you "cooler" than the guy who puts his arms in the air and is genuinely happy and excited about the accomplishment. 3. If you are severely short stacked and up against opponents who are all healthy in chips, playing for a relatively meaningless pot, and you happen to survive the all in in miraculous fashion... celebrate! It's such a fun underdog moment! On the felt, playing for scraps, and coming back from the dead. I had the most fun ever at the Omaha HL final table and couldn't believe how into it the crowd was, especially considering the fact that most of them probably didn't even know the rules to the game. It was electric in there, and a lot of that had to do with my insane rush of all ins where I survived. At one point I yelled out, "We all having fun" and the roar sounded more like a sporting event than an actual... um, Omaha H/L final table, lol. So many people in the crowd came up to me after the final table and said to me how much fun they had watching, that it was a real blast. The players remaining at the table all got into it too. At one point, Danny Alaei's own father was rooting for me! Danny was like, "Hey pops, what's going on over there?" At the time Danny was healthy in chips and I was all in blind. In one hand, all in blind, I didn't look at my hand until the river, so I sweated my hand at the end with the crowd. I had to beat aces full for high, that wasn't gonna happen, but for low I needed to beat a 7-5. First card I squeezed- 9. Second card a deuce! I yelled to the crowd, "We need a 3, 5, 6, or a 7. I pulled out the 3 and the crowd went nuts! It was quite a show, all in after all in until they finally called my number in 4th place. It was the most fun I'd ever had at a final table. After busting out, despite having another tournament to play, I went to the booth to do my exit interview. Apparently other players declined to do the interview, but that's just not my style. Poker today is about more than just me getting in a few extra hands in my next event. This was a live internet broadcast with lots of people watching, and I know that they'd enjoy hearing those that are eliminated say a few words. It's not mandatory and players have a right to decline, that's just not something I would ever do. I think that sort of thing is important in terms of promoting the game. Poker on television is a form of entertainment, and if the players forget that, then poker on television would cease to be entertaining for the majority of people who tune in for the characters more so than the actual game. I brought this up because a player at my table inquired about me getting a penalty for standing on the chair when I was all in for peanuts and won with a pair. He later told me it wasn't personal, he was just curious about the rule. The floor man asked me not to stand on the chair anymore, and so I didn't. No big deal. The issue was pretty much squashed in my book until I heard that another player was blabbing about my celebrations who wasn't even at my table for any of it. Rather than say something to me, they took the cowardly route by going behind my back and talking to people about my "excessive celebration." So clueless. We had a rail of people all there to sweat the final few tables. All of them looking on to see something exciting happen. Umm, Omaha H/L... not the most exciting game to watch! They did get into it, though, when I showed some genuine emotion on the short stack and had fun with it. I did a goofy dance, felt like a giddy little kid, and was just being me. Silly, harmless, goofy stuff. The key principal is that it was ME on the brink each time I did that. Never, ever, ever, did I celebrate loudly when I put a significant hit into another players stack. Not once. It frustrates me sometimes when people just "don't get it." They just don't see the big picture. I mean, if you think back to the WPT's first season, we had players complain about showing their hole cards to the camera. They worried it would somehow cost them money, because they'd be giving away their secrets. That line of thinking was obviously shortsighted, and some of those same people who complained have since profited handsomely from poker's popularity on television. I think big picture. Let's not be nitty. Let's all remember what's most important: those new people who get into poker... those fans who watch poker on television... those corporations who see poker's popularity and are willing to take a chance on investing in the game... let's not forget that poker is supposed to be FUN! Sure there is often a lot of prize money at stake, but if poker fans aren't having fun watching or playing... those prize pools shrink. Good night all. Time for bed. 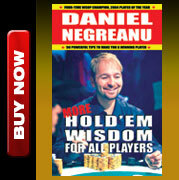 There is still much work to be done at the WSOP, and I can promise you one thing... I'm having a ton of fun at work! I love it. It's a grind and mentally draining, but nothing beats the WSOP.